The Rays announced their roster for the ALDS and there are some surprises. In the bullpen, Joe Maddon kept Wade Davis instead of Jeff Niemann. Not the biggest upset ever, but Niemann has proven that he can be dominant in short relief stints. It is possible that Niemann is not healthy. Also, Maddon chose to go with three catchers, keeping Jose Lobaton. This leaves a big question mark in right field versus lefty starters, something the Rangers will use in three or four of the games in this series. Without Brandon Guyer or Justin Ruggiano, it would seem that Ben Zobrist will be in right field versus lefties, even though he hasn’t started a game there in over a month. And if Zobrist is in right field, who is at second base? Sean Rodriguez is the obvious answer. But that means Elliot Johnson is the Rays starting shortstop. Yay? Another possibility is that Zobrist stays at second base, and either Sam Fuld or Matt Joyce is in right field against the lefties. But that seems unlikely. I think they'll ship him out there and keep Zo at 2nd. They are not going to start Elliot Johnson against CJ Wilson. I don't care how much Joyce struggles. He IS an All-Star. Time to play. I agree with your sentiment, but I don't think there's much chance Matty gets run out there against lefties. Struggling is one thing, but he put up a .477 OPS against lefty starters (he did fare better against relievers) . That said, in 17 career plate appearances vs. current Rangers lefties, he has 7 hits (including 2 homers) and 6 RBI. Very small sample size, but encouraging. Personally, I'm with you, I want him to play. Zorilla/SRod/Joyce feels like it has a greater chance to do something with the bat than Zorilla/SRod/(EJ or Reid). Shortstop was pretty much always going to be an offensive black hole anyway. At least EJ isn't a huge dropoff with the glove. Since Joyce and Elliot Johnson had a similar batting average versus lefties in a similar number of ABs, I hope we'll see Joyce in RF for each game. Then Zobrist can stay at 2B and Brignac and SRod can platoon at SS. Joyce has more power and you are stronger defensively. EJ's a pinch runner. 1. Matt Joyce must play everyday if healthy. 2. Why is Wade Davis not starting today? He is 3-2 in September in 5 starts, with a 3.93 ERA including a great outing on Sunday. His worst outing was 5 runs to the Yankees in the wind tunnel. He is on full rest. I'm intrigued by Matt Moore too. Would have been fine with him starting Game 163. But before Matt Moore there was Hellickson (2010) and WD40 (2009). Feel like we are falling in love with Moore because we haven't seen him fail. He better have command, because falling behind and coming in with fastballs will get him killed by the Rangers, 98 or not. 3. Elliot Johnson hasn't hardly played in weeks (effectively since we got Zobrist out of RF, which was also the time the team's offense got better with Jennings' promotion). If he is in there, that is just ridiculous. Worse than starting Baldelli in 2010 after 10 September at bats, or whatever. 4. Need to bunt Jennings to (a) break him out of his first MLB slump and (b) show the Rangers we are going to go after them. 5. Need to carry 3 catchers so they can be pinch it for liberally. 6. Ironic that the team built on starting pitching is throwing a guy in Game 1 of the playoffs who was wearing a Buiscuit on his hat in July. Matt Moore is legit ace prospect. Hellickson always had a ceiling as a great #2 or decent #1. WD never had a ceiling above a very good #3. These guys really arent comparable. I'm glad Matt Moore is starting. He's averaged 12k per 9 over his entire minor league career and put 11k on the Yankee line up in just 5ip. The Rays will have the ability to run through our relievers (probably WD) if they choose to remove Matt in the 5th as CG Shields will start game 2. I agree that three catchers on the roster is because they are expecting to pinch hit for them. Gotta think Elliot was selected over Guyer or Ruggiano because of the versatility he provides. If anyone in the infield goes down, they have pieces to move since S-Rod can play all positions and Elliot could take his place at short. Wade seems like a long-inning relief or extra inning solution to me. Mostly agree on everything. 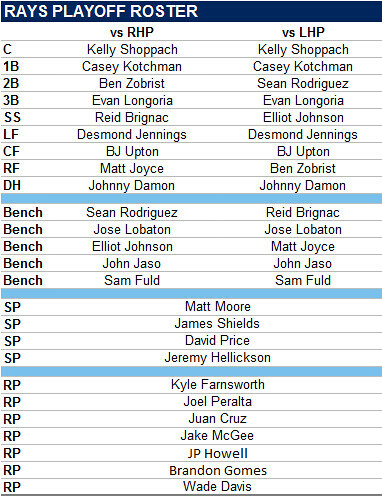 I can't imagine any situation in which I'd actually want to see E. Johnson playing -- rather have either Brignac or Rodriguez at short; can't see Johnson pinch hitting; doesn't run well enough to pinch run. Also I'm stunned see Howell there. He really hasn't had it this year. I can't believe I'm saying this, but I'd prefer Ramos. But disagree on Matt Moore. None of their pitching choices for tonight were ideal (that's what happens when you win a playoff spot in your last at-bat - don't have the luxury of resting your aces) -- Davis was great Sunday but it seems like he's too often had a decent outing and then taken a step back. I have no idea what Moore will do, but we are serious underdogs here, especially in game 1 against Wilson, so I have no problem with Maddon making this move, and if it blows up in our faces I can live with that. I would also assume that Neimann is hurt. And historically, his poor outings have often been followed by a DL stint. The boy is delicate! I am probably the biggest proponent of letting the most talented player play, when the Rays often let contracts and service time and loyalty in the mix; normally that would fall to Moore. I just think he has been so shaky in his most pressurized situations. The Yankee stadium start was impressive for sure, but mitgated by (a) the Yankees watered-down lineup coming off the division celebration and (b) the fat early lead he got. Davis was nails in the Sox and Blue Jays home starts. Even the game in the Bronx he had the proverbial bad inning, but he kept them to a decent # that most teams could come back from. I almost prefer Davis to Price if Price is going to be "fastball only" like his last two starts. Davis won his playoff start in Texas last year. He was the Rays 3rd best pitcher in September and on full rest. It is his turn. He's earned it more than Moore. I hope I'm wrong and that Moore can come through. But man did he look nervous in Fenway. He pitched poorly in the AAA playoffs as well, I think. Can't imagine how he'll handle it today, but maybe 98 mph solves it for him. I'll put my trust in Crazy Joe and enjoy. EJ can play the outfield too. Did so a decent bit in Durham. No nerves for moore! Daddy's Home indeed!